Introducing the Beko DFN04C10W dishwasher 60cm 12 place settings in white. A freestanding model that combines energy efficient performance with a clean white design that makes great use of space. With adjustable shelves in the top drawer this dishwasher is a great choice. The DFN04C10W has 4 programmes to choose from depending on the type of load you are washing. The Eco-Wash is programmed to save water and there’s also an Intensive wash option for those tough, dried on stains. There’s also a Half Load option for when you don’t have a full load to put through but don’t want to be wasting water. A Rapid programme option is available as well for those times when you don’t have time to waste, but want to retain the DFN04C10W’s performance level. A concealed heating element provides hot air to dry your dishes once the wash cycle has finished. The dishwasher also has folding cup racks on the upper basket, and folding plate holders on the lower basket, so you can change the space to suit your load and with a height adjustable upper basket, you’ll have even more flexibility. 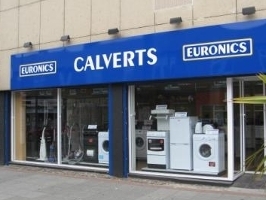 This Beko dishwasher is a Euronics agency exclusive model.